This past week, I had the opportunity to travel to Jardin, Colombia to visit several farms in the region where we buy much of our coffee, and to see the mill in town where most of these farmers sell their coffee and where it’s prepared for export. On this trip, I was able to bring along two people from the MGC staff. Fionn, our head production roaster, and Eric, the lead barista and trainer for the South University cafe. 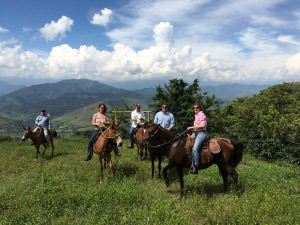 This was the coffee origin trip for both of them and part of the experience was driven by our company mission of connecting our staff with the entire organic system of coffee and how it moves around the world and eventually ends up in the cup we are serving. I last visited this area 4 years ago and much has changed since that trip, mostly in the way that small farmers have taken steps to increase the quality, and the opportunity they have to sell small lots of their best coffee directly to customers like us. In addition, these farmers are paid a premium for their extra efforts in producing these spectacular coffees. During our four day visit in the Antioquia region, we visited five farms (on horseback), tasted coffee from 13 others, visited with students who are sons and daughters of famers attending agricultural college during the weekends, had many wonderful meals prepared in farm kitchens and shared stories and business insight with our compatriots from small roasting companies from Ventura, CA to Brooklyn, NY. We were hosted by Vivian Vasquez, whose family owns and operates the mill in Antioquia as well as another mill in Narino where we source coffee. In Colombia, each farm, or Finca, processes the freshly picked coffee cherry in their own wet mill facility, often only steps from their homes. During the height of the producing season, this occurs at the end of each day when the pickers deliver their bags to the owners mill. It is at this point where the differences between farms practices really start to diverge. Prior to that, the farmers are wholly dependent on their pickers choosing only the ripest coffee cherries from the trees. The standard process from there is the cherries go through a wet depulping machine which removes the outer fruit leaving the inner seeds (beans) which need a lot of TLC before they’re turned into the final product that we roast and brew. These seeds are still covered in a bit of remaining fruit called mucilage which can be removed one of two ways. The primary method is called fermenting. After the depulping has taken place the beans go into a large tank where they stay for 12 – 18 hours and then flushed down a series of tiled channels which removes the fermented mucilage, leaving only the inner bean. A second method uses a demucilager which is something like a centrifuge that removes the remaining pulp immediately. The advantage to this method is the time savings. The disadvantage is that it’s easy to damage the beans if the equipment is meticulously calibrated and that some people think the lack of natural fermenting affects the flavor. The amazing thing about visiting these farms is that even though they may only be 1/2 mile apart on the same road, none of them use the exact same equipment. Each farmer sets up their processing to suit their own unique needs and ideas about what is best, perhaps based on what they can afford in terms of equipment. Hacienda Orizaba, a farm that until the last decade was not producing coffee, was by far the most intricate in processing with all the latest in equipment. Felix Galon who bought the farm has many other business ventures and is able to invest heavily into the rebuilding of his plot. El Zafiro run by the Valez family is a meticulously maintained farm. Managed by a large extended family, their equipment is older but their attention to detail yields one of the best tasting coffees we has on this trip. Less than 1/2 a mile in either direction are 2 other farms we visited. La Cumbre is at the end of the road at the highest elevation of farms in the sector. Alonso Velez has been working this farm for 35 years and his son is studying in the State sponsored coffee education college on weekends, helping his family prepare for the next generation to take over. Andres Giraldo’s Los Angeles farm is the result of a family split. He took the larger piece of land with no mill and no house and has rebuilt his property to not only grow great coffee, but as a destination for culinary tourism where chorizo is made fresh and salads prepared from their garden just before serving. All of the farms we visited around Jardin have also invested in secondary crops to provide both extra income and sustenance for the families. Plantains and avocados were abundant at every meal we were served, as were a wide variety of citrus fruits, many of which we hadn’t had before. When the coffee has dried, it’s taken to a dry mill in Jardin where every single bag is inspected and graded for quality and the farm is paid accordingly. There are two mills in town, one owned by the Colombian Coffee Federation (FNC) or the E’Antioquia mill which only accepts coffee of a higher quality and has the ability to separate and process smaller lots as well as coffee from Rainforest Certified farms, which also receive a premium price. All and all, it’s a wonderful process to witness. It’s possible for us to visit a farm, see the coffee growing on the tree and a few short months later, to have that same coffee being loaded into our roaster in Ann Arbor. Raphael Diaz’s micro-lot at the mill. You can see more photos from our trip on the Mighty Good Coffee Facebook page.